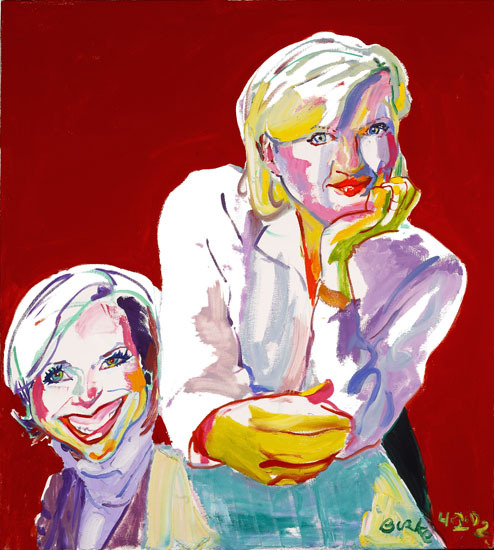 This Group Portrait painted by Philip Burke was first published in The New York Observer in 2002. The Original Artwork being Oil On Canvas with approximate height 40in and width 36in. A REPRODUCTION I of the original painting, is printed on Canvas at approximately 100% of the original dimensions, with approximate height 40in and width 36in. A REPRODUCTION II of the original painting, is printed on Canvas at approximately 60% of the original dimensions, with approximate height 24in and width 22in. A REPRODUCTION III of the original painting, is printed on Canvas at approximately 40% of the original dimensions, with approximate height 16in and width 14in. A REPRODUCTION IV of the original painting, is printed on Art Paper at approximately 40% of the original dimensions, with approximate height 16in and width 14in.